A new chef’s simple but elegant menu and better price point mean it’s time to pay court once again at The Palace Restaurant. Good news: The Palace Restaurant in The Cincinnatian Hotel has been updated. Creamy textured ivories—upholstered chairs, carpeting, and linens—have replaced the dark mauve, blue, and terra cotta color palette from the hotel’s 1987 opening. The pillared dining room, with its warm woods and bright Frederic Bonin Pissarro paintings, has gone from dark, dated luxury to clean, comfortable elegance. But that’s not the only reason to redirect your attention. Talented chef Jose Salazar and inventive pastry chef Summer Genetti are now running the show, and savvy price points (the three-course prix fixe menu is $44!) make this one of the best deals in the city—a combination that could put The Palace back on the local fooderati’s fine dining radar. In fact, The Palace has a history of redefining fine dining. For the first half of the 20th century, hotel restaurants were synonymous with special-occasion fine dining, and thus were one of the first to feel the impact as the chain restaurant revolution took root in the early 1960s. It wasn’t until the 1980s restaurant boom—when the confluence of energies that wed luxury dining with the casual-but-stylish chic of California fusion cuisine—that hotel dining was able to flex some muscle again. In Cincinnati, a handful of chefs led the charge with sophisticated, ingredient-driven food, perhaps none more so than The Palace’s Anita Hirsch-Cunningham. (Full disclosure: I was employed by The Cincinnatian as executive pastry chef and worked with Hirsch-Cunningham during the latter part of her five-year reign; then partnered up with her again through 1997 at Arboreta.) Exotic ingredients from around the globe; fresh edible flowers and herbs (Hirsch-Cunningham was one of the first chefs to purchase greens and produce from local farmer Sallie Ransahoff, a source that subsequent Palace chefs have continued to employ); artistically sauced plates; and menus that changed with the seasons were her culinary signatures. And The Palace’s dining room was full nightly, with local diners easily outnumbering hotel guests four to one. Others noticed: The Palace garnered its first Mobil stars in 1987. After Hirsch-Cunningham moved on in 1993, her sous chef, Paul Dagenbach, took over as interim chef while the management searched for someone who could fill her shoes and keep The Palace dining room at capacity. And they did attract chefs. Many chefs, in fact, starting with Tim Anderson, a 1991 Food & Wine Best New Chef. He left after two and a half years, and other toques followed—on the average of one every couple of years. Some were more capable than others, but none could quite replicate the success achieved during Hirsch-Cunningham’s tenure. Though the consequences that a revolving roster of chefs have on a restaurant are apparent, it was hardly the chefs’ fault, or even the management’s. Whatever internal issues may have contributed to the dwindling number of diners, the external ones were obvious. With so many good independent restaurants offering affordable, contemporary options throughout the city and beyond, the number of diners willing to pay high prices for food amid frumpy formality shrunk (and the post-riot exodus from downtown didn’t help). Without a healthy tourism industry to support them, special occasion restaurants were pummeled, and some succumbed (R.I.P., Maisonette). It’s hard to keep an ambitious chef in the kitchen under those conditions, and er, well…you begin to see The Palace’s vicious circle. Enter Jose Salazar. Replacing Romy Jung in 2008, with his first executive chef toque, the New York City transplant’s previous gigs include much-coveted positions in two of Chef Thomas Keller’s kitchens. Salazar spent two and a half years as chef de partie (a station chef, in this case the fish butcher) at Per Se, Keller’s much acclaimed “French Laundry East” in Manhattan; and was executive sous chef at Bouchon Bakery, the café and boulangerie one floor below Per Se. The great gifts of working in a Keller kitchen are many, but none more so than how he conveys a sincere respect for a foundation of precise technique applied to simple seasonal ingredients, and the importance of being mindful enough as a cook to let the food teach you. “Using the best ingredients and maximizing flavor by doing less to them,” is how Salazar explains Keller’s philosophy to me over the phone. This hardly means shortcuts, as evidenced in Salazar’s French onion soup, less the hearty bistro version than a blonder, deconstructed one in the manner of Chef Jean Georges Vongerichten, another celebrated name on the young chef’s résumé. Salazar reconstructs three ping-pong ball–sized Cipollini onions, stuffing them with caramelized Vidalias and piercing them with snappy shards of bruleed Gruyere (a tuile-like crisp). At the table, a clear chicken consommé is poured over the onions. It’s clean, bright, and not nearly as self-important as it sounds nor as austere as the Jean Georges interpretation. With the recent fawning over molecular gastronomy, complexity is often mistaken for great food, while a dish that appears to be simple is often dismissed. Nothing could be further from the truth here. The elegance-in-simplicity of Salazar’s food carries throughout the menu: first courses of local farm greens with the last of the season’s heirloom tomatoes and sherry vinaigrette; a fabulous squid-ink hand-rolled spaghetti with baby summer vegetables (adorable pattypan squash both times I ate it), tiger shrimp, and crispy squash blossom; a trio of pork—slices of hazelnut crusted tenderloin, smoked belly, and a roulade of braised pulled shoulder meat—atop a puddle of bacon jus for a main course. Is there anything simpler and more underappreciated than hanger steak? Similar to flank steak, but highly prized for its rich kidney-tinged flavor, the cut is not seen on menus very often (since there is only one per animal, rarely weighing more three pounds, it’s not always cost-efficient). Salazar stays true to the French bistro style, serving it sliced with chanterelle mushrooms, Vidalia onion rings, and fava beans. 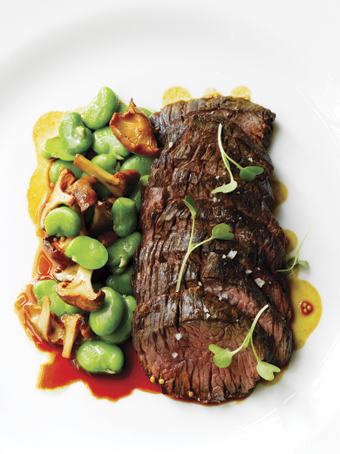 It may not be on the menu by the time this issue is published (Salazar was shifting his dishes toward winter when I spoke with him), but I wouldn’t miss the more pedestrian prime filet of beef if the chef decided to replace it with the hanger steak. Salazar’s lack of preening—no ridiculous novelty items like licorice aioli—is a refreshing shot in the arm for The Palace. On the other hand, pastry chef Summer Genetti can and does strut her stuff, and she’s clearly having fun. Her desserts lean towards the composed, colorful, and architectural sort that can cause neck strain from the constant need to peer at whatever is being paraded through the dining room. You won’t dislike any of her creations, though you may occasionally find a component that doesn’t hold up: slices of underripe peaches accompanying a strudel, or a crème brûlée whose burnt sugar veneer lacks the skating rink crackle. Genetti may make the best chocolate flourless torte I’ve ever eaten: a small brick that gently melts like butter on your tongue, accompanied by toasted hazelnuts and a tiny scoop of obscenely good roasted banana ice cream. Even in the midst of a lean economy, it’s clear that downtown Cincinnati is on a course of exciting development and growth. With an overdue facelift, and a chef who’s creating simple, excellent dishes for educated palates at bargain prices, The Palace seems to be embracing this opportunity to return to the future. Now if only somebody would nab those creepy animatronic reindeer (on display during the holidays) while they’re looking the other way. The Palace at the Cincinnatian Hotel, 601 Vine St., downtown, (513) 381-3000. Dinner Mon-Thurs 5:30 pm-9pm, Fri 5:30 pm-10pm, Sat 5:30 pm-10 pm. The dated ’80s vibe has been replaced with creamy luxurious ivories that draw the eye towards the brilliant and more important, the excellent food. Expensive a la carte ($8-$45); three course prix fixe, $44. Every third Thursday of the month a two-course dinner for two with a bottle of wine is $60(really! $60!). Originally published in the November 2009 issue.